I have noticed a pattern over the last few weeks of people asking, how do you become a Google Trainer and what does that mean. The process to become a Google Apps EDU Trainer is fairly straight forward. I think of there being three stages to this process: Using the Training Center, becoming a Qualified Individual, and finally becoming aCertified Trainer. The Training Center is always available and it's your choice if you want to go through all the stages. The Training Center is available to "teach yourself to become an Apps expert in the classroom." The great part about the Training Center is that it is broken up into six training modules: Google Apps Education Edition, Apps Mail, Calendar, Docs, Sites, and Other Tools. What does this mean for you? It means that if you are in the Training Center to find out more about Calendar, my favorite, you can. Just go straight to the Calendar Module and become a Calendar expert or look for that one piece of information that you needed. Don't forget to use the "Search this site" button in the top right hand corner if you are looking for something specific. As a teacher you could use the the training center to become more proficient in the use of Google Apps for your classroom. So if you just want the information, it's all there waiting for you in the Training Center. If you are interested in testing your new knowledge acquired in the Training Center you can take all six exams. 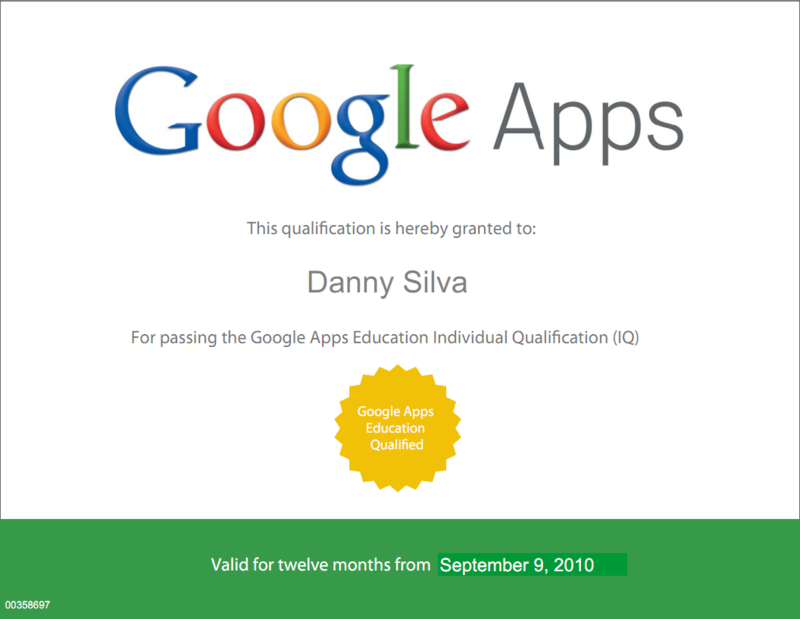 Passing all six exams will give you the honor of being "Google Apps Education Qualified" and earn you a certificate. The exams are $15 dollars each and you will need to pass each exam with a score of 80% or higher. You could give your students the chance to become qualified. I know there are Computer Application courses in high schools that allow students at the end of the course to take tests for certifications for various manufactures of software. Why not let the student take the tests and at $15 dollars per test, it is very reasonable compared to other exams. You've passed all six exams and have decided to go for the gusto and become a Certified Trainer. Now what? According to Google, Certified Trainers have extensive experience in teacher training and Apps deployment. So, if this fits who you are and what you do, go for it. Here are the requirements from Google's Program Details web page. Have previously achieved ‘Qualified Individual’ status. Demonstrate work history and experience in technology instruction and/or professional development. Strong references from school or business clients are required. Create sample learning materials and provide a short video which demonstrates your ability to create and present instructional material. View the complete application here. Early access to technical training and support materials. A Google ‘badge’ for your online marketing, and other marketing collateral. Additional visibility in the Apps Marketplace as a Solutions Provider. Shared training resources from the community of fellow Certified Trainers. I hope this helps to answer the question. How do you become a Google Trainer? Please feel free to ask more questions in the comments. Now get out there and do some training.